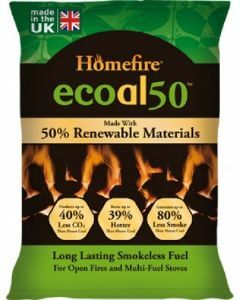 Ecoal50 is a revolutionary smokeless fuel, and is the first coal in the world to be produced from 50% renewable materials. Ecoal50 is ideal for use on open fires, and in multi-fuel stoves. Its sustained and high heat output has made it one of our most popular solid fuels. Due to its high performance, burning Ecoal50 works out even cheaper than burning house coal over time. It also produces 40% less CO2, and 80% less smoke. If you're looking for a coal which is kinder to the environment, but with no compromise on performance, then Ecoal50 Smokeless Coal is for you. 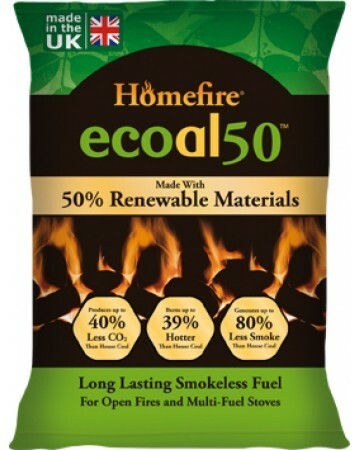 Ecoal50 is approved for use in smokeless zones.